We all know voice is the “next big thing”. 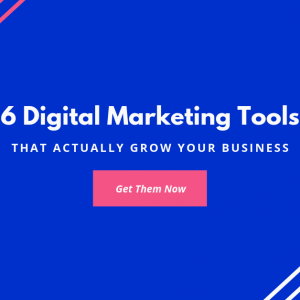 So how can you take advantage of that in your business right now? Surprisingly, it’s pretty easy to get your feet wet with the Alexa Flash Briefing Skill. I was able to set one up and have it approved and certified in less than a day. You can see it here. It’s a simple Flash Briefing that people can add to their daily routine through their Alexa. I’m going to show you how to make something similar to that. Now the fun part! We can start building our skill now! Remember, we’re going to be building a flash briefing as this has the absolute lowest barrier to entry and is something almost anyone, depending on their tech proficiency, should be able to do. The first thing you’ll need to do after opening your Amazon Developer account is to hover over the menu item “Alexa Skills Kit” then hover over “Learn” and click “Shortcut: Start A Skill Now” like in the image below. You’ll be redirected to the Skills Creation page here you can click “Create Skill” to get started. Now we’ll navigate away from your Amazon Developer account and head over to your website. 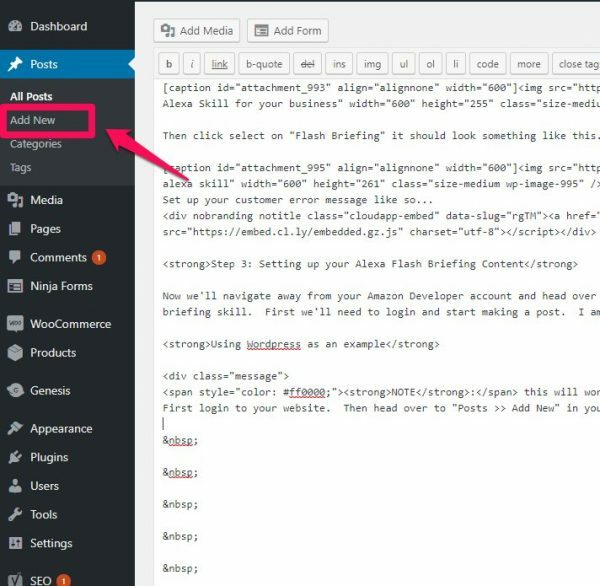 I’m using RobertMcMillin.com in this example but any website will work for the Alexa text flash briefing skill. First we’ll need to login and start making a post. I am going to also create a category and show you how to make that into a feed. NOTE: this will work for any website and I’ll show you how. However, I strongly prefer WordPress for ease of use and versatility. First login to your website. Then head over to “Posts >> Add New” in your WordPress dashboard. For our example we’re making Benjamin Franklin quotes. We’ll then add a new category so we can keep all of our Flash Briefing Quotes posts together and categorized. This will make setting up your feed for Alexa much easier. When you’re making you’re Alexa Flash Briefing, don’t worry if you can’t test the flash briefing through your computer online. You’ll need to link an Alexa device (echo dot, echo, view etc.) to your developer account. Then you’ll be able to test the flash briefing. Text flash briefings can only be tested this way. WordPress is pretty awesome in that it is super easy to grab the feed for the custom category you setup in step 3. 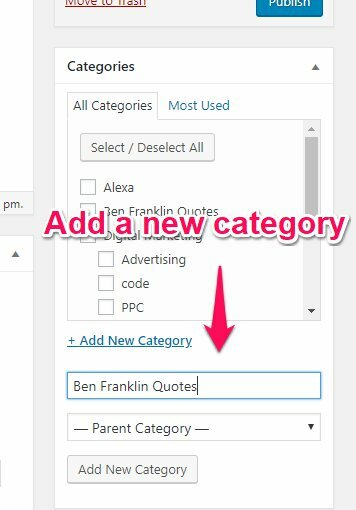 For our example we created the category “Ben Franlink Quote”. So our feed address would be www.robertmcmillin.com/category/ben-franklin-quotes/feed (copy and paste this into your browser if you’re curious about what an RSS feed looks like). Next, we’ll navigate back to amazon.developer.com/alexa, where we setup our account and bare bones flash briefing in steps 1 and 2. After you login, click “Edit” on your flash briefing, you should see something like this and then be taken to a screen (after you click edit) that allows you to enter your feed address and flash briefing information. Setting up the rest of your skill is pretty straightforward. After you’ve clicked “Edit” under “Actions” on your skill you’ll be able to fill out the rest of your skills information. 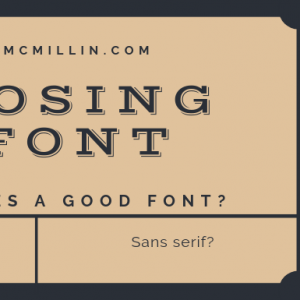 Content Type: Select “Text” if you are following this guide. You’ll want to make a feed Icon as well. The default feed icon is 512 x 512 pixels. When you’re done. Click “Add”. NOTE:If your site uses caching. Purge your site cache first, before you click “Add” in the developer console or you’ll likely get an error. Next, click “Save”. You should not get any errors. If you do, please see the note above and try again. Next you’ll probably want to test your skill and make sure it is working. 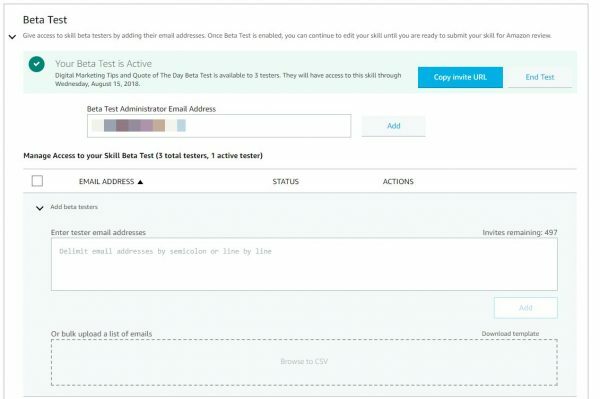 Once testing is enabled you have two options. 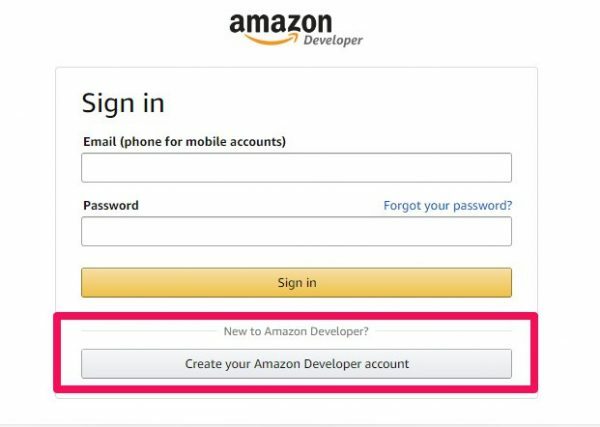 Option One: is to head over to alexa.amazon.com, sign in with your developer account credentials and add the device (echo dot, echo, view etc.) to the account. If you’re echo is linked to another account you’ll have to login to that account and remove it first. Once you’ve linked your Alexa Developer account with an Alexa device the only thing you’ll need to do is say “Alexa get my flash briefing”. Your test flash briefing should play. 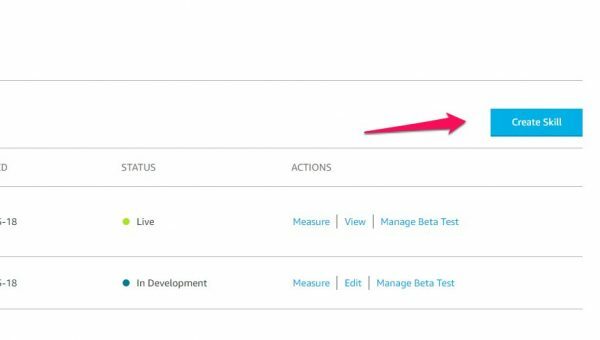 Option Two: In the top menu in the Amazon Developer Console click “Launch” here you’ll be prompted to fill in more details about your Flash Briefing. You can then click “Save and continue”. 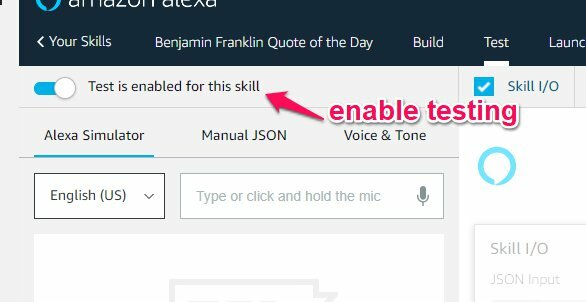 From there, instead of launching your Alexa Skill, you’ll have the option to “beta test” your Alexa skill. Then simply, invite yourself to the beta test. This is helpful if you don’t want to de-link your Alexa from your personal Amazon Account. You’d only need to invite your personal account to the beta test. 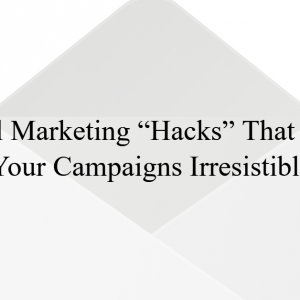 Check your personal email. Accept the invite. Then say “Alexa, get my flash briefing”. It should work like a charm. 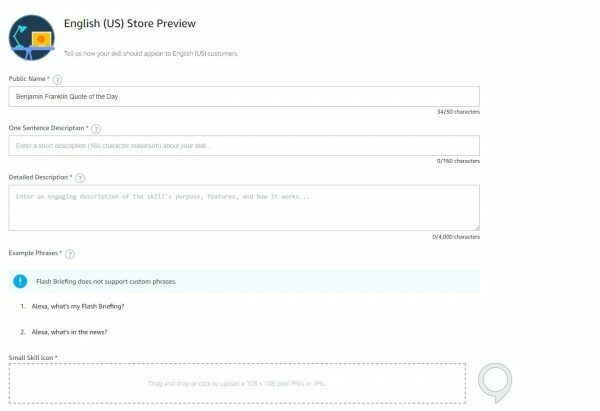 Once you’ve tested your Alexa Flash Briefing Skill, you can now submit the skill for certification and inclusion into the Alexa marketplace. The approval process has, on average, taken about a day for me and is relatively straight forward. You’ve already done all the hard stuff. That’s it your done. 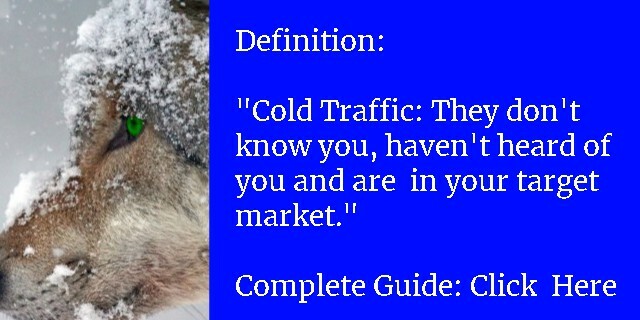 If you’d like to see how it looks in the Amazon marketplace you can click here to check it out. That’s awesome! Thanks! Will be bookmarking this for future reference.